Last week, I warned you to watch out for the lie about stocks. Most people think interest rates are about to go dramatically higher. But they aren't going to go dramatically higher. They CAN'T go dramatically higher. Even the Federal Reserve – which recently raised short-term interest rates to 1.50%-1.75% – said in late March that it will raise short-term interest rates to 3.4% by 2020. It can't possibly raise interest rates that high. It would cause the next Great Recession. I understand why the Fed wants to raise interest rates. It wants to "normalize" interest rates to what we are used to... It wants to have the ability to lower them if the economy starts to struggle again. "The Fed's purported three to four hikes this year beginning in March are likely exaggerated," Bill Gross said last month. Gross is known as the "Bond King" for his many decades of correct calls about interest rates. Today, he agrees with me. Significantly higher rates are not possible. His explanation is simple: "The U.S. and global economies are too highly leveraged to stand more than a 2% [short-term interest rate] level in a 2% inflationary world." In other words, the U.S. and global economies carry a lot of debt today. So why does that mean the markets can't handle interest rates higher than 2%? As Gross puts it, "When it comes to financial markets... the 'beast' is really leverage." It's what caused the Great Recession. And if central banks raise rates too quickly, we'll risk going down that road again. "The Fed, under Jerome Powell, hopefully has learned that lesson, and should proceed cautiously," he adds. In other words, the Fed should stop raising interest rates at closer to 2%. If Gross is right, then what does that mean for investors in long-term bonds – like 10-year Treasury bonds? "Investors should therefore look for 3% plus or minus on the 10-year for the balance of 2018," he says. So... The Federal Reserve says short-term interest rates are going to 3.4%. But the Bond King says we can't have short-term rates higher than 2% in a world of 2% inflation. Who do you think will be right? The Bond King, or the Fed? The Fed is lying to you – in my opinion. It is trying to fool the markets into thinking that it will raise short-term interest rates to 3.4% by 2020. The Fed wants to keep markets in check. It wants folks to know that low rates won't be around forever. Posturing is the best tool it has right now. But 3.4% by 2020? I don't buy it. In my book (and the Bond King's book), as long as inflation is in the range of 2% or less, that won't happen in this economic cycle. Last week, Steve warned DailyWealth readers about a different lie that's catching on right now. "It's true... Stocks hit all-time record highs earlier this year," he writes. "But it's NOT true that stocks are expensive today." Read more here. In a recent essay, Justin Brill argues that the Fed's manipulations have historically led to ruin – and you shouldn't expect a "soft landing" this time, either. "What comes next will be no ordinary recession or bear market," he says. Learn more here. 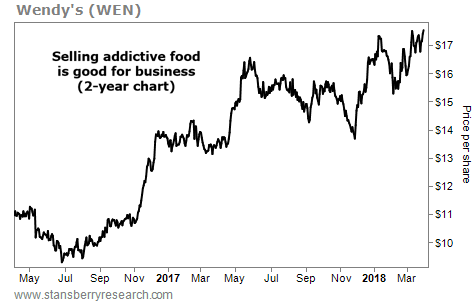 We're talking about $4 billion fast-food chain Wendy's (WEN). The company is known for its "fresh, never frozen" burgers, french fries, and Frosty shakes. These aren't the healthiest options, but they keep Wendy's customers coming back in droves. Last year, the company's North America same-store sales grew 2%... And even more important, they have now risen for the past 20 consecutive quarters.